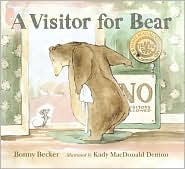 Author Bonny Becker and illustrator Katy MacDonald Denton introduced us to grumpy a Bear and a persistent Mouse in A Visitor for Bear, a picture book published in 2008 and winner of many awards, including the prestigious E.B. White Award given by the Association of Booksellers for Children. Bear and Mouse are back, proving that picture books can often make great reading primers as well. A Birthday for Bear is part of the excellent new beginning to read series, Candlewick Sparks, which includes the wonderful foxes, Zelda & Ivy, as well as my cat and dog favorites, Houndsley and Catina. In A Visitor for Bear, the stage is set for the give and take that plays out again in A Birthday for Bear. Bear is a solitary sort who does not want company. Mouse is cold and hungry and only wants a spot of tea. Popping up in the most surprising places, Mouse manages to wear Bear down, agreeing to leave as soon as he has had one cup. When Mouse keeps his promise, Bear finds himself unwilling to let his visitor leave so quickly and a friendship is born. However, this doesn't mean Bear is no longer a grump. 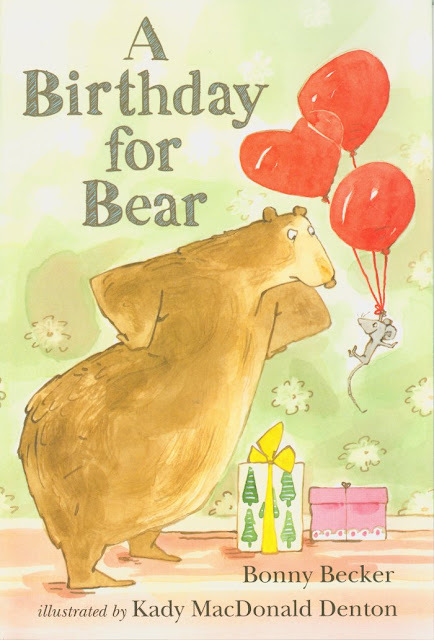 In A Birthday for Bear Mouse is back and looking for a party. How he gets his way and how he makes Bear smile is guaranteed to make readers smile also. There is the repetition of words and visual clues familiar to beginning to read books, but all of the books in the Candlewick Sparks series feel like something more. The illustrations are rich and detailed, worthy of any picture book, unlike most beginning to read books which tend to have very basic illustrations. Although not done in a comic book format, visually A Birthday for Bear has everything the marvelous TOON Books have to offer.